Content marketing has exploded over the last few years… especially among real estate professionals. In this post, I’m going to show you examples of things you can do as a real estate agent or investor to cut through the clutter online and get in front of your best prospects where they’re seeking you out. After all, the old-school ways of marketing as a real estate professional are quickly passing away. 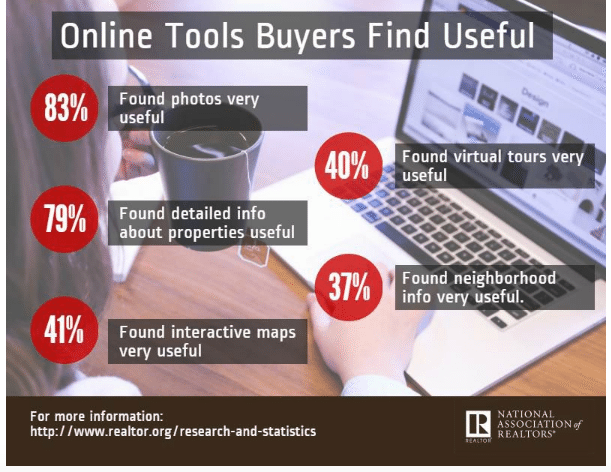 According to the National Association of Realtors, 88% of all home buyers use the internet to collect information. And for 43%, the internet is their very first step. Home buyers of all ages and demographics are seeking help online. And that’s exactly what content marketing does: it helps. It provides your prospects value rather than shouting a marketing message at them. Still, figuring out how to create content that benefits the business’ bottom line leaves many people feeling overwhelmed and outgunned. Where should you start? And how can you compete with other top-notch content marketers in the industry? Without the right strategy, creating content is a grind. And it’s even worse when that content doesn’t reap the rich real-estate rewards you were promised. Whether you’ve tried your hand at content marketing or not… you’re in the right place. Today, I want to give you a content marketing strategy you can actually use. How do I know it works? Because this is the same strategy we use here at Carrot. 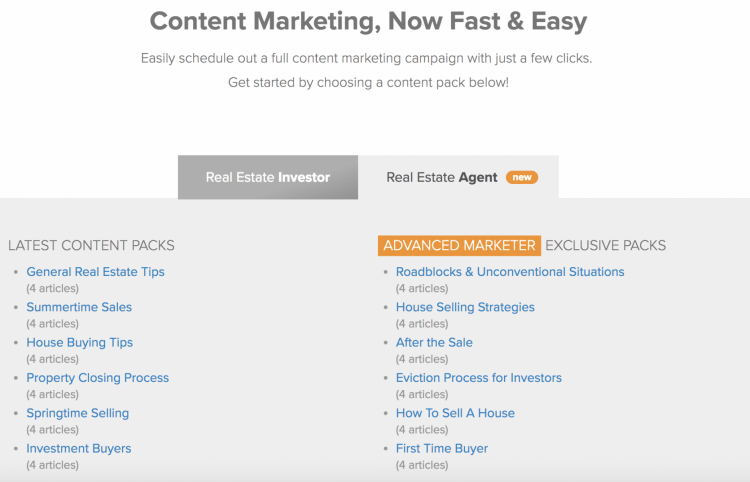 Even more important than our track record is that this is a content marketing strategy built around you, the real estate professional… and what you love. Your ultimate goal is no secret: you want to help more people buy and sell more high-profit homes. And content marketing can help you do that. But, of course, drawing a line straight from your content marketing efforts to profitability is easier said than done. Trust us — we try to do this here at Carrot and it’s diff-i-cult. Often times, our funnel ends up looking more like a pretzel than a cone. However, what you can measure is more familial content marketing metrics. Increase search traffic to my site by 100% in the next 60 days. Grow my email list of new leads by 30 subscribers during February. Generate 1,000 new Facebook fans by Q3. Host digital open houses every month with at least 20 people in attendance. 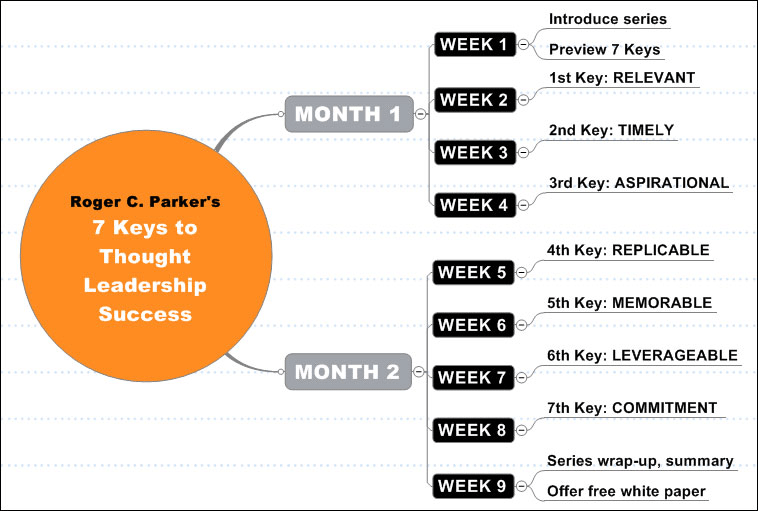 Turn 15% of my new email subscribers into active leads with at least two showings each. Give yourself specific quotas and make them realistic. The more specific your goals, the higher chance that you’ll see them accomplished. Vague goals breed vague results. Specific goals breed tangible wins. To do this, start with a warts-and-all view of where you currently stand. Answer the following questions. How many unique monthly visitors do I get? How many of those visitors view one or more pieces of content? How many of my visitors take an action (i.e., fill out my contact form)? Where are my visitors coming from (search, social, referral, or paid)? How many of those subscribers are “active” (i.e., open and click-through rates)? What are my most successful emails about? How many subscribers have become clients? How many clients from my email list have turned into sales? How many fans or followers do I have on each network? What are my engagement rates on each network? What content generates the most engagement? What is my ratio of original content to curated content? How many visitors is social driving to my site? How many of those visitors become leads, clients, and sales? Once you have a baseline, go back to the “I want to …” examples and formulate two to three measurable goals. On the inspirational front, check out our recent 5 Mindset Habits For Setting And Achieving Your Real Estate Investing Goals in 2017. 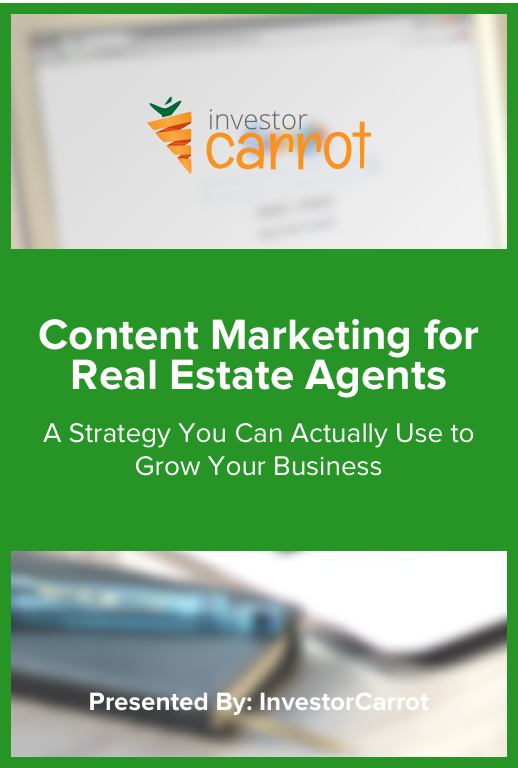 For practical help, download our free real estate content marketing guide. 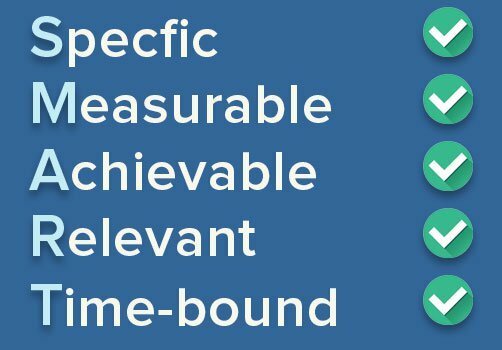 When setting your content marketing goals, make sure they’re S.M.A.R.T. : Specific, Measurable, Attainable, Realistic, and Time-Based. 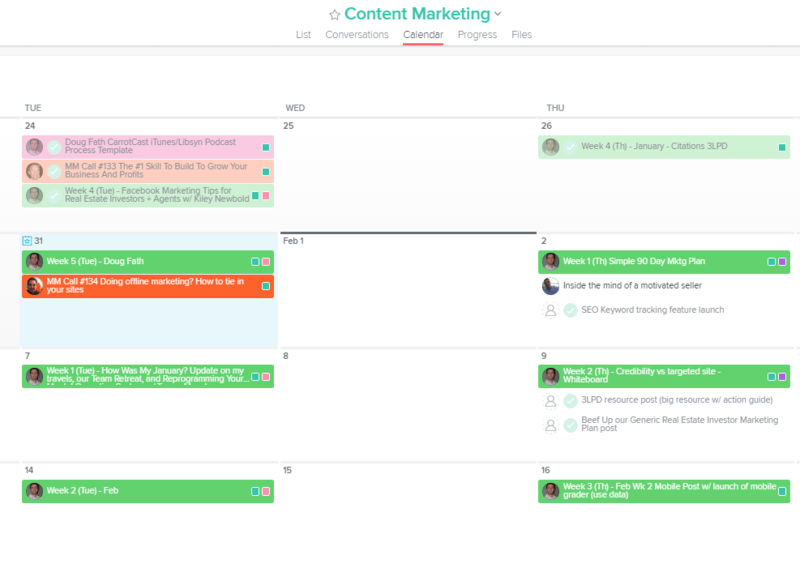 There is a host of great tools to track your content marketing goals. 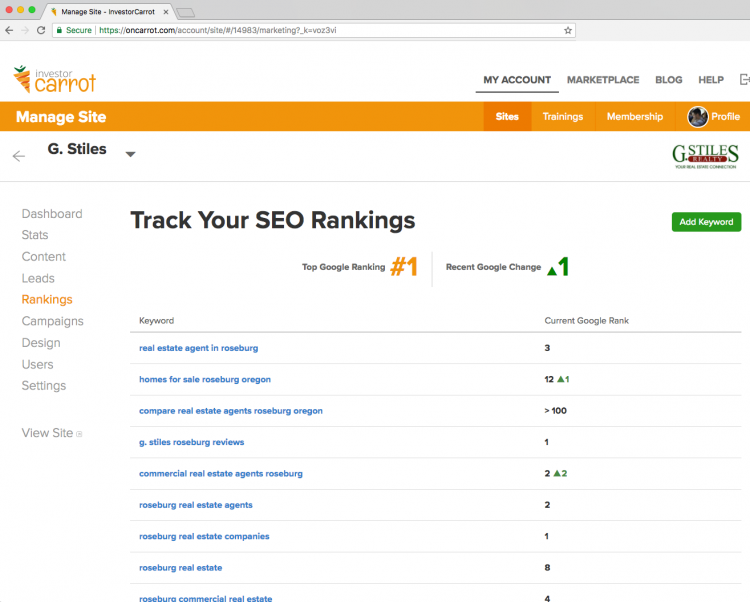 Google Analytics for onsite metrics and our Carrot SEO rankings tracker are two of our favorites. If people are going out of their way to write me an email or leave a thoughtful comment or share the thing but with their own emotional response added … clearly, the thing I made is good. And I can do some serious damage by marketing a thing that is good. And thus ‘URR’ [unsolicited response rate] was born. Whatever tools you choose: set concrete, measurable goals before you do anything else. But, that leads us to an even bigger question: how do you decide what type of content to produce? 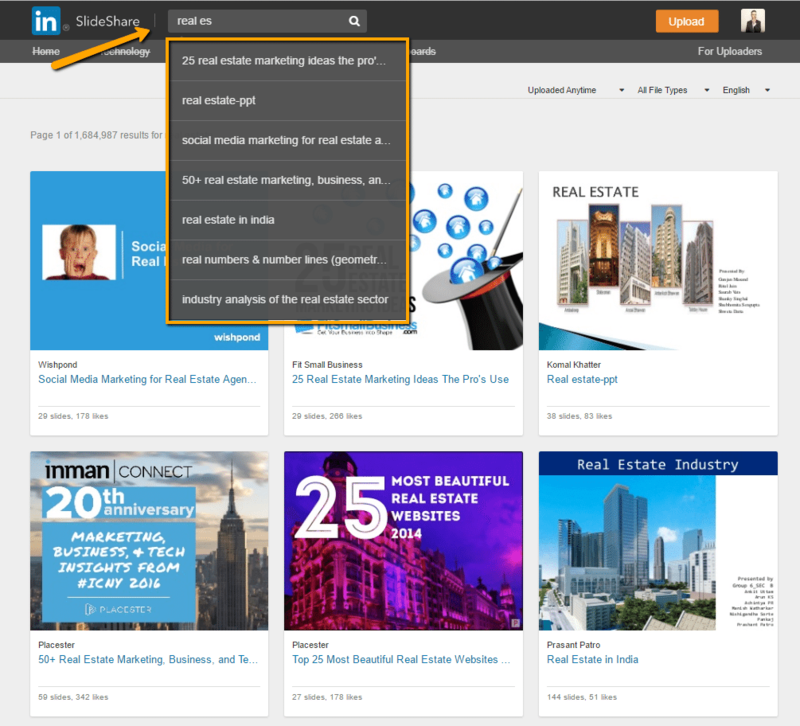 Ask yourself what type of real estate content marketing you want to produce. If you take nothing else away from this article, let that be it. Fitting your content marketing method to your own skillset, natural drives, creative flow, and — above all — passions is a must for two reasons. Because if you don’t want to produce the content that you’re producing, you won’t keep producing it. Content marketing is about helping people, and if you hate what you’re doing … it’ll show. What follows is a more detailed list of content options. As you look through them, consider what you like doing, what you are good at doing, and what you could keep doing over the long haul. Oh… and don’t be afraid to implement more than one, as we’ll discuss later. If you love to write… then blog. Tons of platforms exist to get you up and running, from cheap and low-cost builders like Wix, Squarespace, Weebly, Godaddy, LeadPages and others… to high-end custom websites. If you’re trying to decide, take a peek at this video we put together that walks through the options. 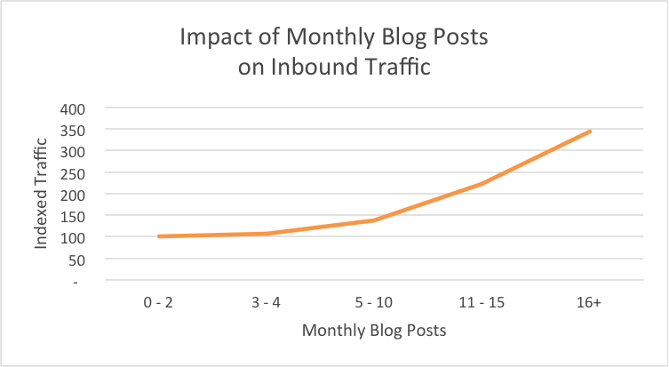 Blogging can immediately increase your traffic. 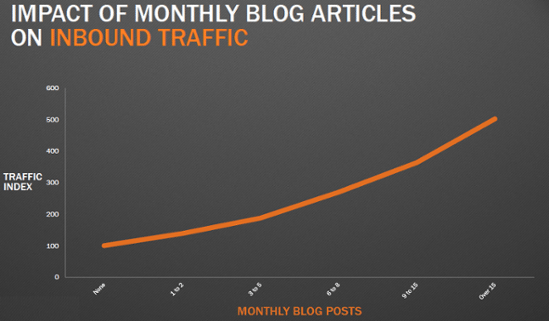 Companies who blog 15 times or more per month generate 5 times as much traffic as companies that don’t blog at all. 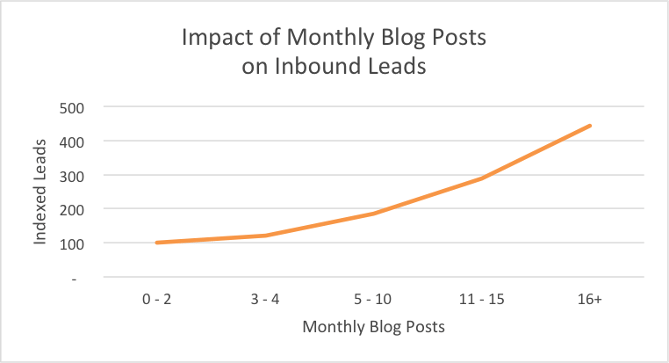 Additionally, companies who make blog publishing a priority are 13 times more likely to generate a positive ROI. Don’t be afraid to keep your blog posts short, especially if you’re an inexperienced writer. Keeping it short is far better than losing your reader’s attention. However, blogging guru Neil Patel did some of his own research and found that posts over 1,500 words generated 68% more tweets and 22% more Facebook likes than those that had a lower word count. Just make sure quality isn’t lacking. Always, always, always, quality over quantity. If you produce shoddy content, no one will want to read it anyways and you’ll waste your time. 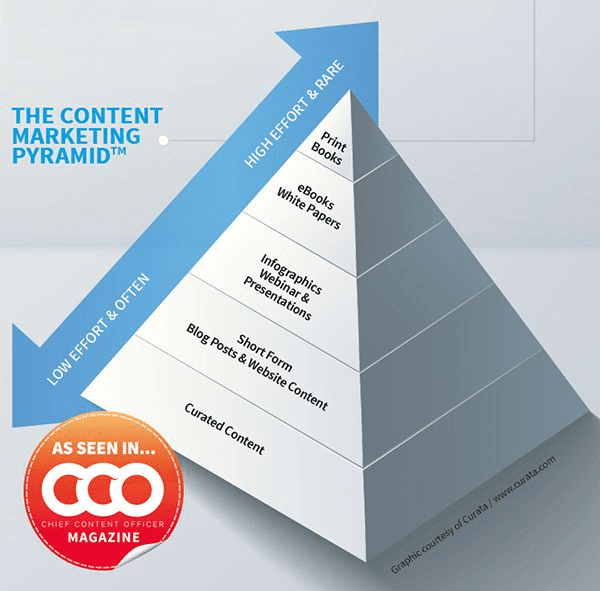 Notice at the end of the post mentioned above — The Content Marketing Pyramid For Real Estate: More Results With Less Work — there are two links. These links prompt the reader to take action and continue along the involvement funnel. Finishing your blogs with some sort of call to action (CTA) is the best way to turn your readers into leads. The more tangible and specific your advice and information, the more that your audience is going to engage. Use numbers, charts, practical advice, and creative images to communicate inventively and attractively to your audience. Also, with a Carrot membership, we’ll provide you with professionally-produced monthly blog content specific to your area of operation. So if you don’t have the time to do all of this, but you want the SEO and trust-building benefits, check out our plans here. If you love to talk… then podcast. Podcast listening is on the rise culturally. 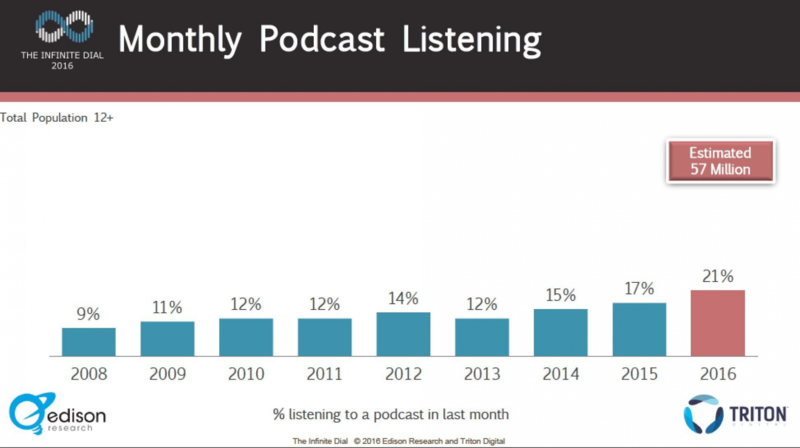 Podcast listening grew 23% between 2015 and 2016. With these tools, you’ll be off and running. If you have a bigger budget or are an experienced podcaster, consider looking at a Portable XLR Recorder, an Audio Interface, and Pop Filters. Your podcasts don’t have to be long, and they don’t have to be just you. The most important thing, though, is that you provide useful information to the prospective buyer and link everything back to your social media and website. iTunes, SoundCloud, Podomatic, and Libsyn are four stellar places to consider hosting your podcasts. If you love to present… then make videos. 100 million internet users watch online videos every day. And just like podcasting, non-professionals are welcome. Similarly, Facebook Live allows you to post share-worthy moments off the cuff. If, for example, you’re constantly giving away tips or “buyer beware” insights on the job, pull out your phone and just start recording. Zac McHardy, an Australian real estate agent, tried his luck using Facebook live when he hosted a 25 minute Q&A session. He received 5 offers on the property immediately after posting this video. Alternatively, you can go the whiteboard route like we do, here at Carrot. Of course, before you get excited and sell body parts to afford the highest quality equipment, consider using basic stuff to start out. Phones today have excellent cameras and might be a great place for you to start. Later on, you can consider getting editing software. If you love getting crafty and creative… then design. 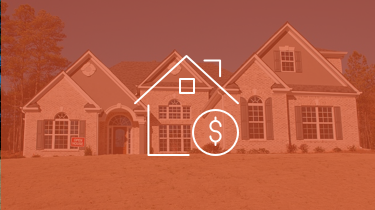 The National Association of Realtors found that 83% of online buyers found photos very helpful. People like to view images — especially in real estate — more than blocks of text. Thus the rise of the infographic. Take this infographic with 6 homebuyer tips, as inspiration for your own. But what if you’re not a Photoshop pro? 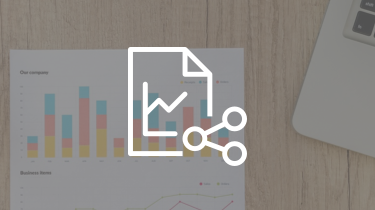 Vengage, a free infographic maker, allows you to create your own infographics by choosing a template, adding visual stimuli, and then customizing your design. A bit more versatile, Canva makes graphic design easy and allows you to customize everything from infographics to presentations. You can post these infographics to your social media, your blog, your website, or even make physical copies and send them as direct mailers. The more you authentically help people for free, the more they’ll want you to help them when they have their wallets out. If you love organizing … then create slide decks. Slide decks — whether using PowerPoint, Keynote, Prezi, or Google Slides — are a safe and effective way of producing quality content. And they pack a punch. 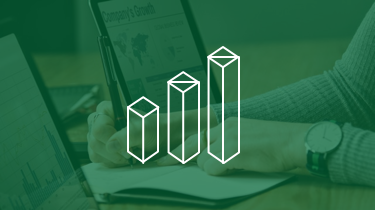 Along the same creative vein as design but with a bit more formality, slide decks allow you to get useful information to potential buyers in a compact form. Slideshare, which consistently receives 159 million views a month, is free to use and easy to incorporate. Even better, this option is perfect for real estate pros who already have a few standard presentations that have been used in group settings or one-on-one with new clients. For example, Tips For First Time Home Buyers is only 11 slides long and visually sparse. Which makes it really easy to find topical ideas for your own Slide Decks. If you love sharing expertise… then answer questions. This option may be the mother of them all. 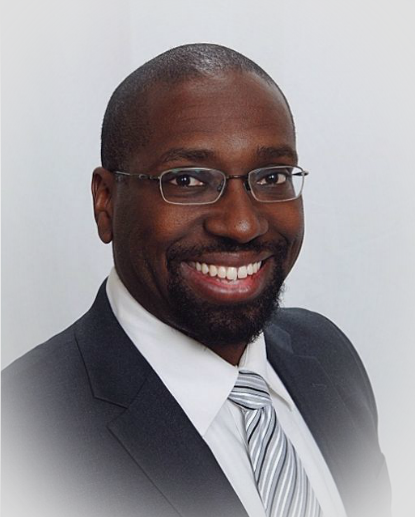 Because the job of a real estate agent or investor is primarily to answer people’s questions. You probably spend the vast majority of your day doing this already, so why not carry over your most-asked questions into some strategically placed online content? Even more conveniently, you and I both know that all the questions you get asked from people are … well, the same questions. They might be framed a little differently, but overall, most inquiries are a variation of no more than 20 or so fundamentals. Incredibly, social media, for Carrot members, is the third best generator of new leads. Social media is a highly personal mode of communication. 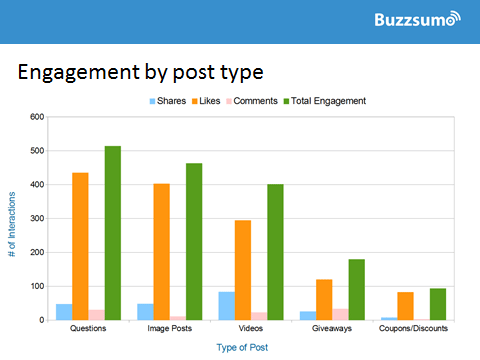 And — as I’ve pointed out before — after analyzing over one billion Facebook posts from roughly three million brands, Buzzsumo discovered that questions generate the highest engagement of all content types, even beating images and videos. The implications of all this leads to one conclusion: why not bring together the kind of work you do on a daily basis with the most popular form of content on social media? Make a list of the top 20 questions people ask and answer them one by one in whatever format you like. Maybe you prefer to blog. Maybe you prefer to podcast. Or maybe you enjoy creating infographics. Whatever the case, every piece of content you create should revolve around the type of content you enjoy producing. Question: what’s better than content marketing? Answer: content marketing that doesn’t require extra creative juices. Instead of constantly creating new content — which is daunting and exhausting — repurpose what you’ve already created. For real estate content, let me show you what I mean. Write a blog post. Publish. Create 5-10 social media images — using Canva, Venngage, or WordSwag — with quotes from that blog post. Publish one image every third day with a link back to the post itself. Turn that blog post — particularly the subheadings, any data, and its practical tips — along with your social media images into a Slideshare. Last, turn your Slideshare into a Youtube video by presenting it or simply talking over it as a Screenflow. Let’s assume for a moment, though, that you aren’t starting with a blog post. 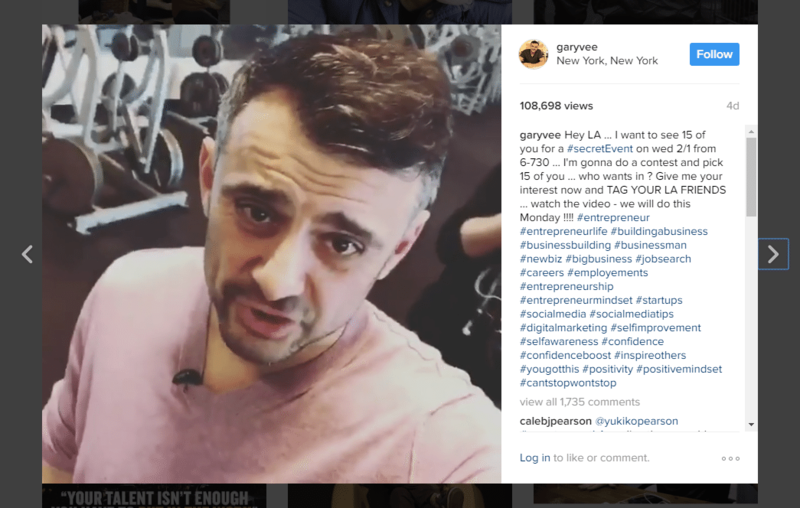 What if you start with a video? Consider these steps to repurpose your own video content. Start with a series of short Q&A videos. Facebook Live is a great tool for this. Record yourself answering just one question each week. Take that YouTube video and make a blog post out of its transcript. Carrot members can do this easily using VideoPost. Then, take that blog post and breathe new life into it through social media images and a Slideshare. We’ll dive more into the magic and power of repurposing soon, but you see the point: it doesn’t matter what your love is, nothing you create should be “one and done.” Repurposing will save you time and supercharge your presence across multiple content types and platforms. I have yet to meet a person who doesn’t benefit from deadlines. As much as we’d like to believe that we don’t need the extra incentive to accomplish our goals, we do. Deadlines will not only create urgency, but they will also help keep your priorities organized. Why this focus on getting regimented in your content marketing? When you release a large variety of content, you reach a large variety of people. It’s also true that posting regularly builds trust with your readers. It’s important to post content often. The more content you post, the more traffic and leads you’ll generate. And here’s my last piece of good news — to be successful, you don’t have to do anything quite so amazing. You just have to be consistent. Pro Tip: Write down content ideas whenever they come to you. You’ll have periods of time that you get a lot of ideas, and then you’ll have times where running a marathon would seem easier than coming up with another topic. In order to post content regularly, it’s important to plan for these seasons of content-block. Think of your schedule as your boss. You can’t not show up for work, right? So don’t just neglect your schedule. We make priorities for what’s important in life. You can make time to post scheduled content. Don’t procrastinate. If it’s on the calendar, it’s law. The amount of content on the internet is daunting. And the amount of unsuccessful content is depressing. You’re bound to make mistakes as you start publishing, but don’t think of these as failures, think of them as opportunities to learn. 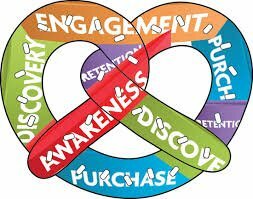 Above all, remember: find your content marketing love and make that approach the cornerstone of everything else. Wow. this is one of my favorite pieces of content that you have produced. Thanks for putting the time into this. My wife and I were just talking today about finding a content marketing strategy that she will enjoy.